When is your cutting head not perpendicular to the work surface? When the material is warped, or becomes warped during cutting via stress relief. When you are using Dynamic Waterjet®. This device automatically angles the cutting head up to 10 degrees to compensate for taper and stream lag (see this post for details on stream lag and taper). To compensate for V-shaped taper, the head angles slightly and puts all the taper on the scrap side of the plate leaving your part with a straight wall. 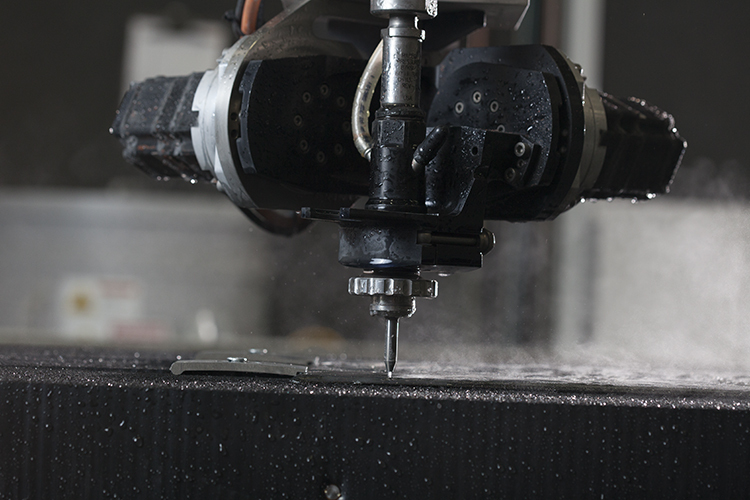 With Dynamic Waterjet®, the cutting head tilts up to 10% to remove taper error from the part, and also tilts forward slightly to reduce the impact of stream lag. With a 10 degree angle on the head, a 20 thou (0.020”) height error = 3.5 thou (0.0035”) error on the cut part. Not good at all, but it is worse at greater angles, such as bevel cutting. When cutting a bevel of some type. In all of these cases the cutting head is not perpendicular to the work surface. In case 1, your material is sloped and you want the standoff height to remain constant at all times. In case 2 and 3 the cutting head is purposefully angled. Holding a 0.1” (2.5mm) standoff height is important because even the most minor error in height – too much or too little – will change the contact point of the jet, causing you to cut a bad part. In case 2, using Dynamic Waterjet, a 0.02” height error will give 0.0035” dimensional error on the part if the head is tilted to 10 degrees. This is just trig; Tangent = opposite/adjacent. Tan10=X/0.02”. In case 3, using Dynamic Waterjet® XD to cut a common 45 degree bevel, a 0.020” height error will actually put a 0.020” error on your part. Now, you’ve probably exceeded the tolerance band allowed on your print. If you want a precision part, you need to maintain cutting-head-to-material standoff height. Advanced technology of today, provides far more precise measurement of the nozzle tip from the material. Traditional height sensors have a horizontal ring that drops down around the mixing tube (where the waterjet shoots out) and follows the changing height. Two things can cause inaccuracy with traditional approaches. First, the change in height tolerance band might be too substantial. Some systems won’t adjust height until a 10 thousandths of an inch change has occurred (0.010”, or 0.25 mm). With such a wide tolerance for height change, you simply cannot cut an accurate part when the head is tilted. Second, the ring does not contour to match the angle of the material – the ring stays forever horizontal. This means that when the material is warped the outside edge of the horizontal ring will touch the material and lift the mixing tube too high, causing part cutting errors. The solution is to have the resolution of the height adjustment very fine (10 x finer), to make the height adjusting commands happen quickly without delay, and to ensure the contact ring always contours to the actual surface it is measuring. It needs to pivot around the point where the jet is in order to provide a precise height reading. New collision and height sensing systems, like Compass, provide high precision cutting even when a 45 degree bevel is being cut. In closing, using a precision contour follower is important for 2D cutting with a conventional waterjet that does not tilt, especially with materials like stainless steel that are either not delivered flat or become warped during cutting as stress is relieved. It’s even a bit more important with Dynamic Waterjet taper control cutting, where some part error will come into play with as cutting head standoff height changes. And, it is very important to maintain standoff height with steep angle cutting with Dynamic Waterjet XD, such as creating 45 degree bevels. such as bevel cutting. Many contour followers also provide collision sensing, such as the Compass, to stop the machine if contact is made with a workpiece or fixture, saving the machine, the obstacle, and operator headache. Hope this was helpful. Looking forward to your thoughts. Nice post.Waterjet can cut any type of metal with high accuracy and definite shape.